One especially unique group of mattresses by InnoMax is InnoPedic. They all share an innovative support core. There are three models in this series or brand: InnoPedic Self-Adjusting Natural Latex, InnoPedic Self-Adjusting Memory-Cell, and InnoPedic Self-Reinforcing S.G. They are all about 8" high. For some reason, InnoMax did not list its three InnoPedic models together as a collection or brand. Instead, the listings for Memory-Cell, Natural Latex and Gel mattresses each have an InnoPedic branded model. What sets the InnoPedic mattresses apart from the others is their unique support system, the Energized Support Core. It boasts an Isotropic design, which provides what InnoMax calls Omni-Directional Support (isotropic means "equal in all directions"). InnoMax says is is activated by a sleeper's motion. The Energized Support Core is an array of ringed elastomeric cylinders about 1⅔" in diameter that compress when weight is applied or increased. They rebound when weight is removed or lessened. In this they follow the pattern of pocket coils, Dormeo's foam springs, and Reverie's Dream Cells, all systems of independent support units which automatically adjust to the weight and shape of a sleeper's body. The Energized Support Core sits on a base foam layer about 1½" thick. On top is an approximately 3¼" foam comfort layer. All InnoPedic mattresses also share the same cover. The top panel of the cover has a waterfall cut (draping over the sides). 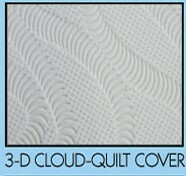 It is a 3-D knit, trademarked as Cloud-Quilt Flex-Knit. The three-dimensional texture allows the cover to be more flexible. It also makes it more breathable. Differentiation among the three InnoPedic mattresses is in the composition of the comfort layers. This is reflected in the names of the models: latex, memory foam, and gel. In the first two models, Self-Adjusting refers to the support unit. In the first model, the comfort layer is natural latex. This is vulcanized foam rubber made from the sap of the rubber tree (Hevea brasilensis). The chief advantage of latex is its resilience. Latex provides pressure relief and spinal support. It does not sink in the way memory foam does. It is also cooler. Vertical pores increase airflow for ventilation. 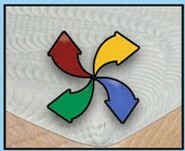 Memory-Cell in the second model is InnoMax's version of memory foam. This material is used for its contouring conformability. Like latex, it relieves pressure and supports the spine. It also cradles the sleeper. Memory foam tends to be warmer than latex, but some people prefer it anyway for the cradling. The comfort layer of the InnoPedic S.G. is unique in itself. As is seen in the illustration, it is a grid of cubicles. The cubicles are made of semi-rigid gel. The company's description does not say whether they have a shell or skin. Self-Reinforcing in the model name refers to the way this grid compresses to cushion the sleeper, then recovers its original form when the weight is off. InnoPedic mattresses are covered by InnoMax with a 20-year limited warranty. The first 10 years are 100% coverage, and the last 10 are prorated. Full coverage on the cover is for 2 years.